In France, as in Japan, we call them Kakis and down here in the South West they are very, very popular. I'm not very sure what they do with them, whether they make marmalade or compote or cakes but there is a tree in every garden turning russet red right now and lots of old ladies are on market stands are selling them among their wares for over a week. I'm waiting for our first frost to harvest ours but looking at the forecast for the next 2 weeks, it doesn't seem to bode well for winter weather. This is of course great news for Carol, Jean Francois and my cold hating chickens and bees but so many vegetables like brussels sprouts, winter kale and cavolo nero seem to improve after a good, cold night. 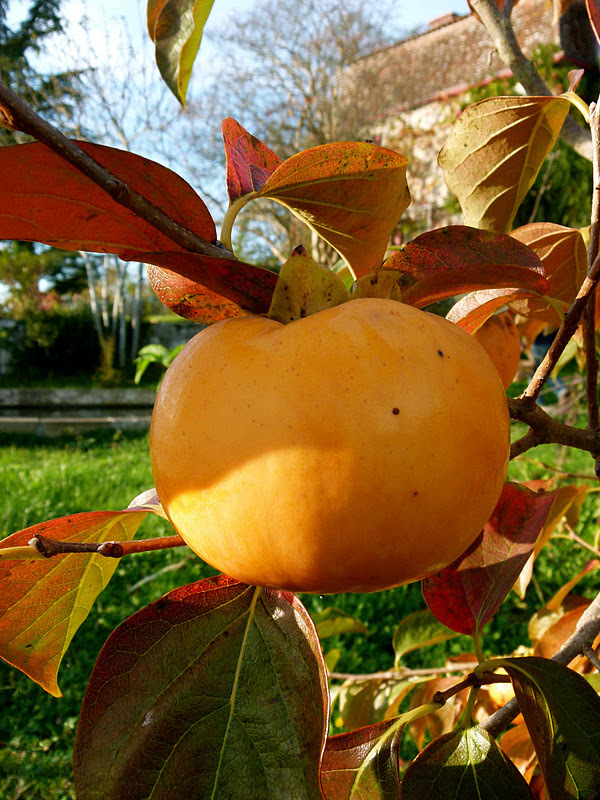 Persimmons are no different! Rich in tannins, they need a good strong frost to break down the cellular wall to ripen the fruit. In order to jumpstart the ripening process, Before using them, I'll just have stick them in the freezer for a night and imitate the "normal" weather cycle. 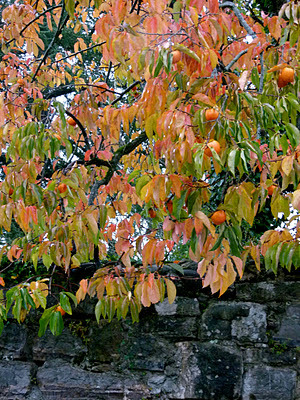 Arriving in Mailhos, we already had an ancient persimmon tree overlooking an eastern wall but the form of the tree, its leaves' autumn colours, not to mention the smooth, round fruit that dangles and shines like christmas decorations, encouraged us to buy another to plant nearer the main house. Unfortunately the hachiya variety we bought must have been pumped and injected with fertilisers or botox in its previous life and reaching Mailhos went into resting mode, because after 5 years in our naturally, rich and nourishing soil, it has not grown a centimetre and sits there in its optimal spot, protected from the winds, with a panoramic view of the Pyrennees and the blue sky overhead and just makes baskets and baskets of fruit which break its fragile branches and attracts plenty of mad, local hornets who go crazy on the spilt juice. 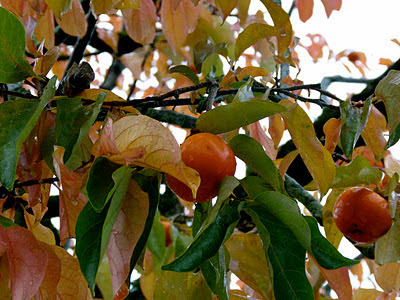 Ripe persimmons are good for you! Rich in vitamin C, minerals, antioxidants and betacarotene and can apparently save you from a heart attack and maybe even diabetes by revving up the bodies' metabolism. For a flu or cold, a juice of persimmon with grated ginger will chase all bugs and bacteria and the Japanese, whose national fruit it is, use the leaves as a tisane to ease any digestive complaints. All in all a splendid addition to our garden and if needs be, I can always carve some golf club heads or billiard cues with the hard wood of the tree itself.... if it ever grows! Until it ripens, the fruit is almost inedible. Its astringent and feels furry in the mouth. Its the high level of tannins that are so unpleasant and unpalatable before it is bletted or softened. although its firm texture is marvellous. Once ripe, I just need to remove the wavy calyx and scoop out the flesh. The fruit itself becomes a mini-juicebowl, apricoty in flavour but can be a little too jelly-like in texture. From there on it is seasoned with lemon juice and added to salads, served in a salsa with crab and lobster or reduced to a puree and drizzled over foie gras, mixed into fruit bread and cakes or thrown into a smoothie or compote to tingle up a creamy dessert. Soak the gelatine leaves in a bowl of cold water. Pour the tin of coconut milk into a small saucepan and add the sugar. Heat slowly, stirring constantly, until the coconut milk is well mixed and the sugar is dissolved. Bring to the boil and take off the heat. Add the gelatine leaves and stir well, until melted, into the cream mixture. Pass the mixture through a sieve into 4 individual glasses or bowls and leave to cool. 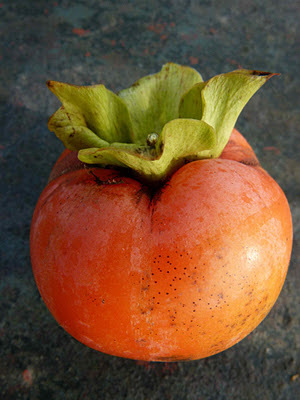 Scrape out the flesh of the persimmons into a blender and add the grated ginger. Blend the mixture together. Once the coconut cream is solid, spoon over the persimmon puree and serve with a few leaves of fresh mint and perhaps an almond florentine. 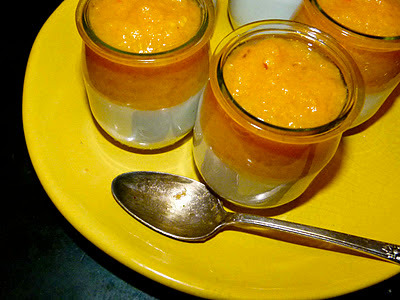 Merci pour ce post et votre blog délicieux .Je vais me lancer de ce pas dans votre recette de Persimmon pannacotta.Trois kakis devraient bientot arriver dans mon jardin.Pour l'instant j'en achète et en mange tous les jours.Je me sert aussi du kakishibu (jus de kaki fermenté ) comme d'une couleur. - Ngươi thật sự có nắm chắc không, nhưng ngươi đừng cậy mạnh. Giữa không trung Trầm Linh có chút lo lắng, dù sao nàng còn không biết thực lực của Nhạc Thành. - Ta biết, đợi ta tránh ở sau là được rồi. - Thái thượng trưởng lão, hôm nay chính là ngày các nàng tỷ thí, thực lực của Nhạc Thành không có thể chống lại tên U Minh tông kia đâu. Hồ điệp cốc, La Phương có chút không yên tâm, nếu hôm nay Linh nhi thua, toàn bộ Hồ điệp cốc sợ gặp phải phiền toái. - Không thành vấn đề, chúng ta cùng đi, U Minh tông cũng nhanh đến rồi. Áo lam lão phụ sắc mặt trầm xuống, nàng đã cảm ứng được người của U Minh tông cách Hồ điệp cốc không xa, đối với thực lực Nhạc Thành, nàng tuy rằng không rõ lắm, nhưng ba ngày trước ngay cả hơi thở của nàng đều không làm gì Nhạc Thành được, phỏng chừng thực lực cũng không dưới nhị tinh đấu tôn. Lucky me! I was fortunate enough to be one of the "testers" of this recipe over a lovely meal.... It was delicious and the ginger is really a key ingredient (according to me) so don't leave it out... Bon appetit! well i should tell you about my japanese dried persimmons - whole. alta tingle, who owns the gardener in berkeley california - the goddess of gardeners, has a row of these trees in her garden in healsburg, ca. 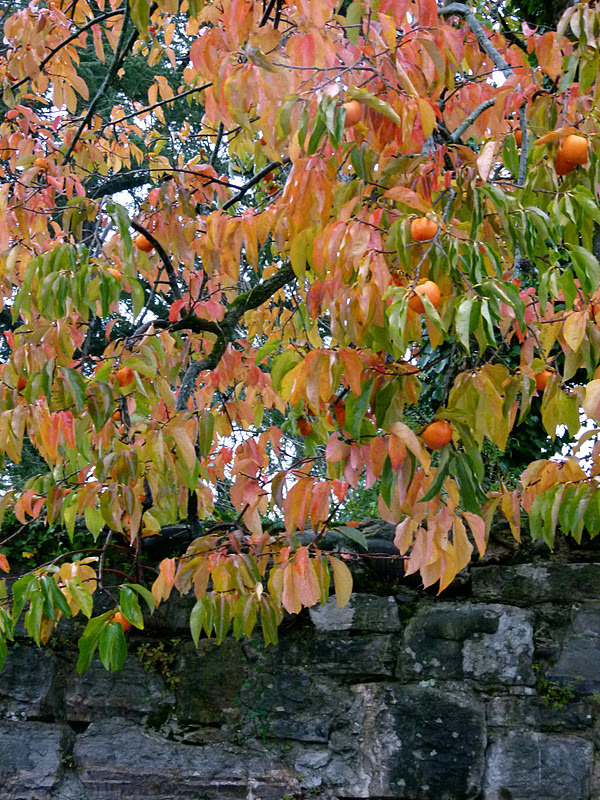 her head gardener gave me a bag of dried, whole persimmons once, when i was there to photograph her garden. little did i know the exquisite, rare beauty of this dried fruit. it is an ancient japanese art form, to dry them whole. one must have first the stem in tact, then a string hanging one from each end over something. 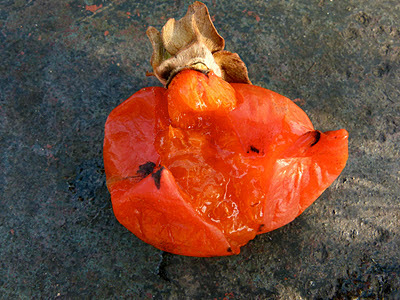 every day you massage them, as they dry, to enable the fruit sugar to come slowly to the outside of the persimmon. it takes weeks and the weather must be just right. 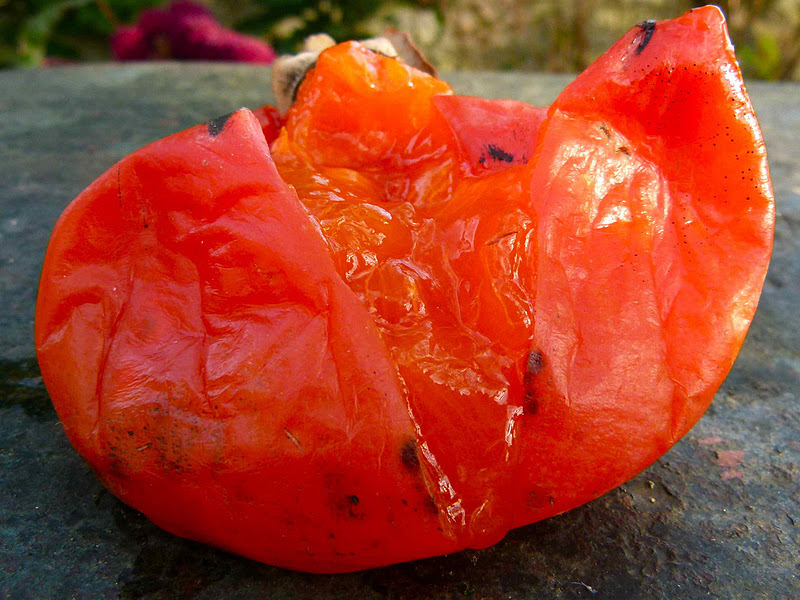 after, you have a whole, dried, persimmon that is just short of heaven itself. please do look this up. in california, there are only a few asian farms still practicing this art - and they sell for a fortune - $75 per pound! you will never taste anything like it. .
Now this really sounds like heaven! I'm going to have to go to California to taste this! ... an excuse to fly. I like this fruit a lot! However, in Germany it's difficult to find the proper kaki - mostly they are immature and undeveloped. Unfortunately, it's rare occasion when we find delicious ones. Can I get some of yours? :) They look so fabulous! 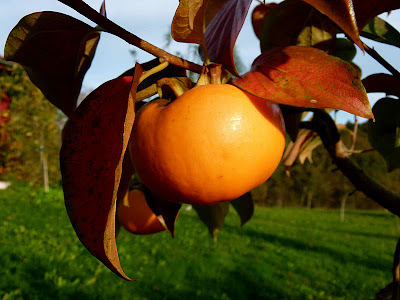 Its funny I was collecting the persimmons daily (I had at least a hundred on one tree) and I went out this morning, after the first frost and guess what??? the birds had gobbled down them all between 8 am and 10am. Thrushes are smart! ... So I have none to give you but next year!!!! hoshigaki is the asian name for the technique of drying them whole and massaging them. i hope next autumn you can try it. it you have an ago, it may well sire you to dry them near the stove.